The DPRU has been paired with Fedesarrollo of Colombia, with the specific aim of informing decision makers in South Africa, Colombia and more widely, on the issue of ‘Informality and Inclusive Growth’, based on comparative research on the two countries. The project will explore how the transitions between unemployment, informality and formal employment might affect or promote inclusive growth at both individual and macroeconomic level, and to what extent these lessons can be applied to other countries in Africa and Latin America, understanding that this subject is very case-specific. ELLA Summit on Informality and Inclusive Growth, Johannesburg 4-5 October 2016 Summit Report is now available: The key objective of the summit was to offer participants the opportunity to learn first-hand about experiences from Sub-Saharan Africa and Latin America in terms of policies around informality and the impact of informality on inclusive growth. By discussing results of the ELLA research on South Africa and Colombia and their respective regions and by sharing participants’ views and experiences from their work in this area, the expectation was that participants would be able to take back useful lessons that could be translated into action in their own contexts. The 2016 Learning Alliance on Informality and Inclusive Growth highlights report is now available. The three month exchange and learning programme between Latin American and African policymakers, practitioners and researchers, featured discussions on a range of issues relating to informality and inclusive growth. Design and Methods paper: "Informality and Inclusive Growth". Sets out how the authors will explore the transitions between unemployment, informality and formal employment and how they might affect or promote inclusive growth at both individual and macroeconomic level. May 2015. Regional Evidence Paper: Cassim, A., Lilenstein, K., Oosthuizen, M. and Steenkamp, F. (2016). “Informality and Inclusive Growth in Sub-Saharan Africa”. DPRU Working Paper 201602, May 2016. Comparative Evidence Paper: Oosthuizen, M., Lilenstein, K., Fernandez, C., Medellin, J.C. and Fernandez, F. (2017). “Rethinking the effect of informality on inclusive growth: lessons from Colombia and South Africa for their regions”. ELLA Research Paper Series: Economic Development: Informality. Fernandez, C.; Lilenstein, K., Oosthuizen, M. and Villar, L. (2017). “Rethinking the Effect of Informality On Inclusive Growth: Lessons from Colombia and South Africa”. DPRU Policy Brief 17/47. Cassim, A., Lilenstein, K. and Oosthuizen, M. (2015). "Informality and Inclusive Growth: What South Africa can tell us about the benefits and costs of informal employment". DPRU Policy Brief 15/44. Users of development research find it difficult to access and use research knowledge from other regions (continents) of the ‘global south’. The UK Government (DFID) funded a first phase of Evidence and Lessons from Latin America (ELLA) to enable greater access to Latin American evidence and lessons by decision makers in Africa and Asia. In Phase 1 (2010-2013), ELLA researched and synthesised Latin America’s experiences on some 20 economic, governance and environmental themes, and ran ‘learning alliances’ on six of these, connecting Latin American, African and Asian peers in online and offline exchange and learning programmes. In light of the lessons drawn from the first phase, a second phase of ELLA (2014-2017) was designed, again funded by DFID, and coordinated and supported by Practical Action Consulting (PAC, Latin America) and the UK Institute of Development Studies (IDS). 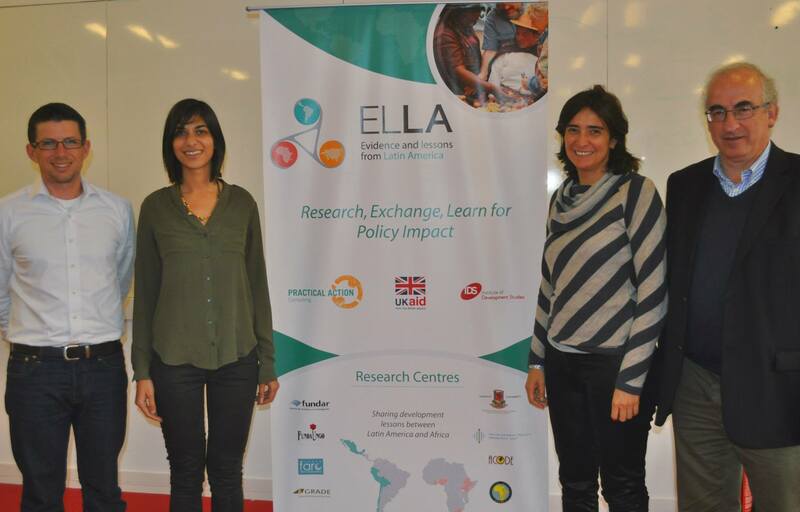 The core objective for ELLA Phase II is that: “Policymakers, policy influencers and practitioners in African and Latin American countries learn from comparative evidence from the two regions on priority economic, governance and environmental issues, in order to inform their policies and practices, and ultimately to reduce poverty.” This comparative research will be conducted by paired Research Centres from Latin America and Africa. The core idea is that decision makers should learn from evidence and experience from the other region/continent – contextualised to their own country/continent. The analysis of labour markets in Colombia and South Africa provides an opportunity to create a framework broad enough to understand the complex paradox of informality. Having similar per capita incomes in both countries, South Africa stands out for having relatively high levels of unemployment and low levels of informal employment, whereas Colombia has a lower rate of unemployment, but with a persistent and high (through declining) level of informality. As a result, in pursuing the objective of achieving inclusive growth, South Africa views the informal sector as a mean of reducing unemployment and consequently aims to promote entrepreneurship through self-employment. Colombia on the other hand, views informality as a constraint on the growth of the formal sector, a drain on the fiscus and unable to provide sufficient support for a better standard of living. Whilst the informality outcomes have been different, a thorough examination of the informal sector is of critical important to both Colombia and South Africa in the broader context of inclusive growth. Colombia’s informal sector is large and the government has concentrated its efforts on trying to reduce informality as a way to improve the social protection of workers and improve productivity and increase fiscal revenues. Formalising the informal sector could indeed have an impact on economic growth and regulation. In South Africa on the other hand, the informal sector is far smaller compared to a number of emerging markets. The sense is that the small informal sector is linked to its persistently high unemployment rates and the sector therefore has a role to play as a type of ‘safety net’ for those without formal employment. Consequently, across different spheres of government and even within spheres of government, views of and levels of support for the informal sector can vary widely. The DPRU intends to present evidence-based research that can guide economic policy as well as regulation, with project outputs to be delivered in the later stages of the project.